A new book by G. William Domhoff (Routledge, 2013). Available direct from the publisher, or from Amazon.com and many other booksellers. It is commonly accepted that America saw the rise of liberalism in the wake of the New Deal, especially during the three decades after World War II. Based on new archival research, G. William Domhoff reveals this period instead as one of increasing corporate dominance in government affairs, affecting the fate of American workers up to the present day. While FDR's New Deal brought sweeping legislation, the tide turned quickly after 1938. From that year onward nearly every major new economic law passed by Congress showed the mark of corporate dominance. The influential Committee for Economic Development was a guiding force for presidential administrations and congressional leaders. Domhoff accessibly portrays documents of the Committee's vital influence in the halls of government, supported by his interviews with several of its key employees and trustees. 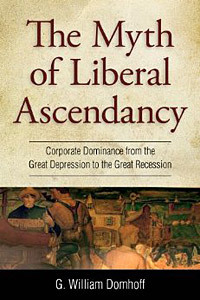 In terms of economic influence, liberalism was on a long steady decline, despite two decades of post-war growing equality. Ironically, it was the successes of the civil rights, feminist, environmental, and gay-lesbian movements -- not a new corporate mobilization -- that led to the final defeat of the liberal-labor alliance after 1968. These cultural successes generated just enough backlash to turn whites toward the Republican Party. It then became possible for the corporate community to solve its emerging economic and political problems through the offshore manufacturing and high interest rates that killed off inflation and the power of unions. A review of The Myth of Liberal Ascendancy appears in the September 2015 issue of Contemporary Sociology; you can download a PDF of the review here. VERDICT: Whether or not they agree with him, historians and political scientists will need to reckon with the reach of Domhoff's argument, the depth of his research, and the controlled passion underlying both. Domhoff has made a career arguing that the United States is dominated politically and economically by the corporate rich. His first book, Who Rules America? (1967), still in print, set the tone for all his books since. In this new title, Domhoff proceeds, administration by administration, from Franklin D. Roosevelt to Ronald Reagan, to document how the nation's organized business community has consistently thwarted attempts by the 'liberal-labor alliance' to change power structures in any significant way. He bases his argument primarily on research in the records of the Committee for Economic Development (CED), a public policy organization founded in 1942. The organization was led by moderate corporate officials often at odds with the 'ultraconservative' business wing but sufficiently aligned with them and with Southern Congressmen to ensure the success of shared goals, especially opposition to the labor movement. Through analysis of Congressional votes on relevant issues and close reading of CED policy papers, Domhoff makes a convincing case that business leaders were more influential in the development of public policy during these decades than most other accounts would have it." "Domhoff has long combined meticulous research with persuasive reasoning to reach conclusions about politics in the United States that overturn conventional wisdom." "No one who wants to claim understanding of the nature of American economic policy can ignore this work. Domhoff has meticulously scrutinized dozens of episodes over the last half century in the endless political battle to achieve a semblance of economic fairness and social justice. As the story unfolds, we see the ways that corporate power has profoundly restricted the capacity of government to promote equality of opportunity and economic security -- even when some headway was being made. Those who think they know that story will find in this work a great deal of news and much to challenge their presuppositions." "Domhoff's exhaustive review of national policy-making from 1939 to the Great Recession inflicts major damage on studies that find periods of liberal ascendancy alternating with periods of conservative dominance. Students will find abundant evidence in his research." "This is a beautifully written inquiry into how the United States moved so far to the political right in recent decades. Professor Domhoff provides a careful analysis of one of the most dramatic and important transitions of our times: the transformation from relative equality during most of the years immediately before and after World War II, to a world in which a well-organized and politically-engaged corporate community accelerated a movement to the right, starting in the 1970's. In addition to making an important contribution to understanding historic political shifts, this book also contributes to our understanding of patterns of inequality and the concentration of social and financial resources in the hands of a small portion of the population. The book is a must-read for sociologists, economists, political scientists, historians, and anyone who cares about inequality." "In his most recent book, Domhoff debunks the view that the United States moved toward greater equality during the New Deal and that it wasn't until decades later that the power elite began its rise to power. Instead he convincingly demonstrates, contrary to the "fairy tale" of a liberal-labor ascendancy, that the large corporations have been well-organized and politically mobilized since the late 1930s and that the U.S. has experienced increasing corporate dominance ever since."